Gorgeous picture, isn’t it? That solid line there is the Space Shuttle Discovery as it orbits Earth, awaiting on final descent permission over the weekend. 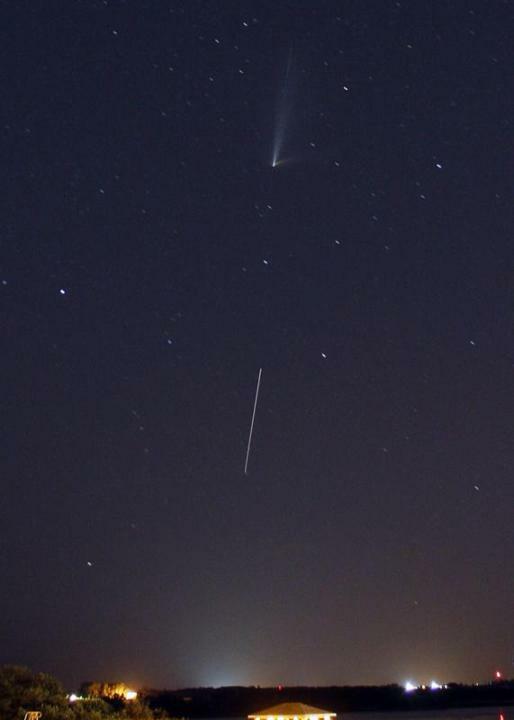 It landed safely in California, due to bad weather in Florida, but what’s the comet-looking trail behind it? I’ll give you a hint: it’s really gross. That beautiful contrail is actually frozen astronaut urine. If you can track penguins from space via poop trails, it’s only natural you can follow the flight of the Space Shuttle via toilet flushing. Technically, they’re dumping water from the storage tanks, as you can’t dump off excess water weight while docked to the International Space Station due to pollution risks. You’re looking at about 150 pounds of pee, shower waste, condensation, and fresh water supplies getting released into the upper atmosphere, then freezing into that lovely vapor trail. Being an astronaut has to be embarrassing. You’re trapped in a box with strangers, you wear a goofy jumpsuit, you’re forced to do goofy stunts for school kids, and people keep track of your bathroom habits from thousands of miles away. What a way to treat a gaggle of Ph.D.s and astrophysicists!